Sweet Sincerity: Spring is in the Air! It's hard to believe that just a week ago, we were experiencing a full blown snowstorm here in frosty New England. This week, the sun has been out, melting what little is left of our remaining snowbanks and warming the temperature to a balmy 60 degrees Fahrenheit! Ah, the beauty of the manic Maine weather. In order to celebrate the fact that spring is in the air-whether is remains in the air is anyone's guess-I decided to pick out a few Spring Fashion Finds to share with the great big blogosphere. 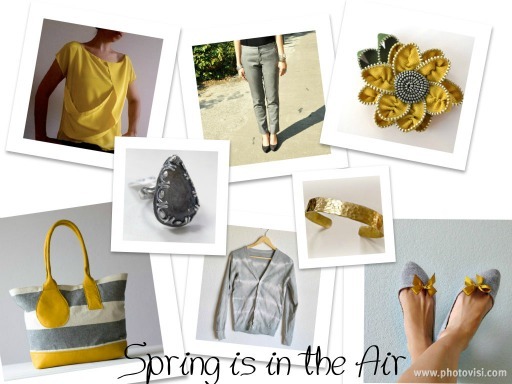 The color palette for this collection is cloudy gray and sunshiny yellow-a perfect reflection of the colors of the spring season here. Enjoy these fabulous finds, perfectly coupled with a few Sweet Sincerity pieces! I love what you've collected here, lovely palette! Thanks for the feature! Please use coupon code Bethany to save 15% in my shop! What a great name for a coupon code!!! :) I am so pleased that you like the feature.